Learn to operate and manage your outgoing emails in Reply's Outbox section. Make sure your campaigns are up and running within daily limits. 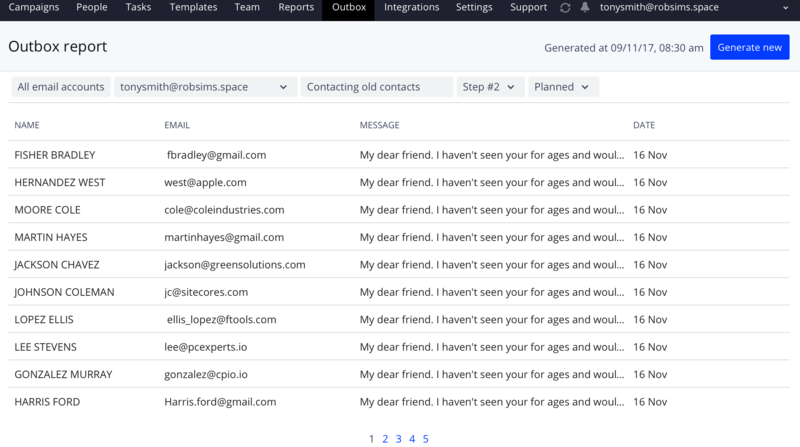 Outbox lets you see the number of emails planned for sending from all email accounts connected to your Reply account, with a breakdown by days. For more information about the layout of the Outbox page, see the following article. Outbox is useful when you run several campaigns simultaneously and may exceed the existing daily limits. Using Outbox, you see planned sendings by each campaign and understand, whether you have enough email accounts with daily limit to send the expected number of emails per day in each active campaign. Note, if you run campaigns from the same email account, Reply sends emails not simultaneously in all campaigns, but in sequence, and distributes the daily limit (400 emails a day) across all active campaigns. In this case, the more campaigns you run, the more email accounts we recommend to connect for sending (5 emails accounts in one Reply account maximum). You can also stretch the schedule in such way, to make campaigns send emails at various times during the day. Below we will analyze several Outbox report examples on all levels. In this example, the user has connected 3 emails accounts for sending, where 1100 is the sum of limits of each email accounts set by user, and not the general limit for the user account (maximum limit is 1200). Hovering over the progress bar shows the limit for a particular email account. If you have several email accounts, you can click on any account to switch to another level of Outbox and see the list of campaigns with a limit for each campaign (see the Example 2). You can also scroll the forecast other than Today and Tomorrow. The example shows that load on email accounts and campaigns is distributed evenly, and a user can add more prospects to the campaigns or create new campaigns and send emails from these email accounts. The example shows that the user should better add one more email account because 2 active campaigns in one email account exceed the daily limit. The Limit column shows the daily limit. The maximum daily limit is 400 emails, but a user can set less in order to plan sending in portions each day. This is the last level of Outbox - already sent or planned emails to your prospects. The list shows the exact sending sequence in the sending queue. For example, on this screenshot you can see that FISHER BRADLEY will be the first prospect to receive the Step #2 email, HERNANDEZ WEST will be the second prospect and so on. On this level you can edit the message to each prospect in order to make it more personal. Click on the text in the MESSAGE column to open the campaign preview mode and edit the message text. Note: you can edit only Planned messages.